Exceptional 18th Cent Welsh Sycamore Dairy Bowl. Wonderfully light weight, distorted to a slight rippled shape with age. 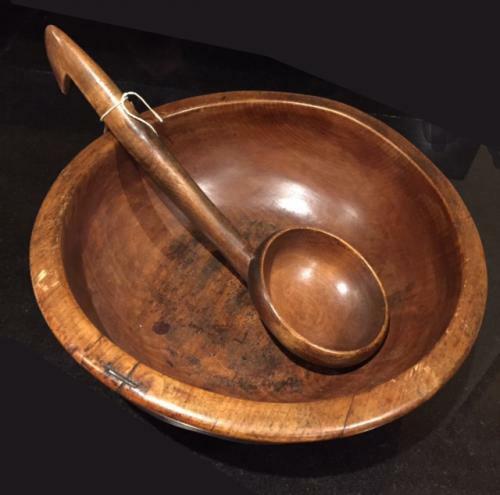 This bowl has a wonderful 'Conker' brown colour and a rich patination with age. Probably one of the beat Dairy bowls I have had in years. It has had an early repair to one edge with an old staple fixing to secure a crack hence the price (otherwise it would be double this price in most shops). Shown in one pic with the early Welsh serving ladle.